On Saturday, December 12, 2015, I had my first book reading and signing at my local library. It was a sweet first showing and I am enthusiastic to do more! 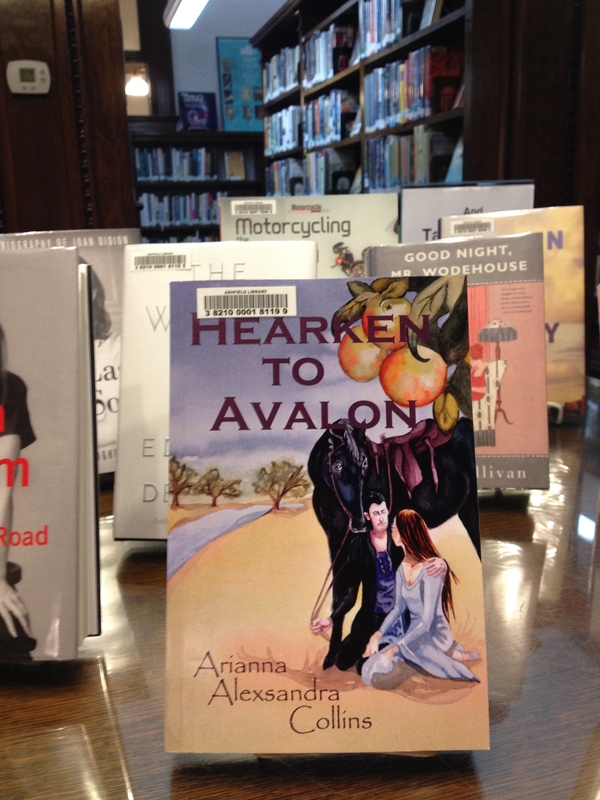 What is equally exciting is to see my novel, Hearken to Avalon, on display at my local library, Belding Memorial Library in Ashfield, MA. It just tickles my heart as I walk past the books on display that there is my “baby” front and center! And also so sweet to see – my novel at Ashfield Hardware. We don’t have a local bookshop in my town. Instead we have a place reminiscent of a “catch-all drawer.” All those things you need (or think you may need at some point) but can’t seem to categorize them into separate spaces so they all go into one place. Ashfield Hardware’s motto is: “Anything Practical, Practically Anything.” And my book is on sale at this community store – Huzzah! If you would like to have Hearken to Avalon available at your local library and/or bookshop (or “catch-all” store, please do request it! Your librarian and/or store owner can purchase it through CreateSpace or Amazon. The Kindle version of Hearken to Avalon will be available shortly after the New Year. And look forward to an audio sometime in the future as well. 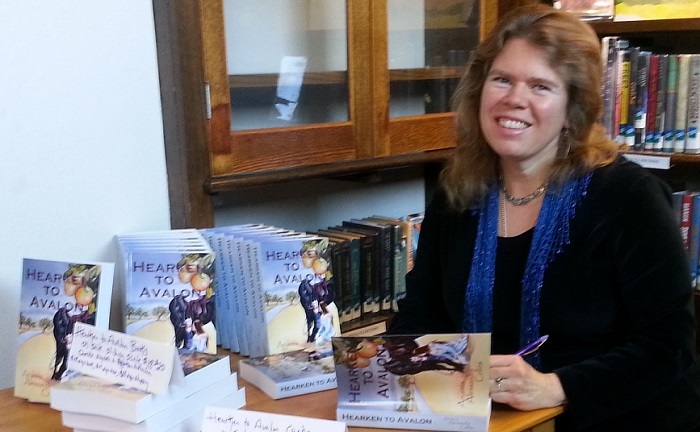 So if you are seeking a thought-provoking, spicy, historical fiction novel, then please consider Hearken to Avalon! Hearken to Avalon offers revisionist history, wholesome entertainment and a focus on cooperative love. Get lost and found in an “Into the Woods” intermingling of myths and legends. This family had claimed Guy and these Avalons had laid claim to the Pendragon. Robin suddenly felt he had walked into a fairytale. Get excited about the possibilities for new insights into old characters. Condone the rebalancing of power relations between genders. Support a work that puts the Environment at forefront rather than as mere backdrop. Read tangible examples for growing compassion, honesty and self-love in a world increasingly rife with peacelessness, lovelessness, and polarized viewpoints. Feel titillated exploring how a couple can rise in love and work together trustingly and lovingly as a team. Support a dream of Hearken to Avalon catching like Wildfire and being enjoyed by many! Spread the word! This is Hearken to Avalon! This entry was posted in Historical fiction, Love story, Novel and tagged Arianna Alexsandra Collins, Avalon, Belding Memorial Library, Book Reading and Signing, Hearken to Avalon, library, local library. Bookmark the permalink.